Do you sell a CLI521 grey cartridge for the Canon MP640 printer? I can see you sell all the other colours but this one isn't listed? The Canon Pixma MP640 inkjet photo printer is a 5-colour printer requiring two black ink cartridges and the cyan, magenta, and yellow, inks. The Pixma MP640 printer will not accept a grey ink cartridge which is why we don't list this item for use in your printer. I have a Canon Pixma MP640 printer. I've put a set of four cartridges in my basket (which includes the black). I need to get another different black as well don't I? Which one do I need (can't remember and can't find it in my manual)? Thanks for your help! Are the cartridges you supply for the Pixma MP640 genuine Canon products? We supply both genuine Canon MP640 ink cartridges and our own premium brand compatible Canon MP640 cartridges. You should easily be able to distinguish between genuine and compatible inks as the genuine Canon products are pictured in the official Canon packaging and have 'Genuine Canon' written to the right-hand side of the image, under which is the Canon logo. Our compatibles have 'Premium brand reciclyed ink cartridge' written next to the image. If you click on an item you can read more about the differences between our genuine Canon inks or compatible ink cartridges in the items description. Choosing MP-640 inkjet cartridges takes just just a few minutes, that's almost nothing when compared to the tedious mission of getting in touch with every individual shop there is nearby for your replacements. Why waste any precious time. We have already carried out the research so you can order the full range of replacement ink cartridges that will be a suitable match to use in the MP 640 printer. Save some time and also money if you purchase printer supplies from Cartridge Save! Purchase genuine or compatible Canon cartridges today through us to save cash with the provision of free next day delivery as standard. So we are able to show that Cartridge Save not offer anything besides superior quality cartridges, each ink cartridge includes our market-leading 12 month cash back guarantee - in case you run into a problem within the 12 month return your inkjet cartridge to us for your money back without delay. Network-ready and well-connected, the Canon Pixma MP640 is aimed at small offices and photography enthusiasts seeking an affordable multifunction printer that promises high-quality prints in both monochrome and in full colour. Despite the slightly improved print speed and the efficient scanning and photocopying capabilities, the Pixma MP640 is expensive to run. Canon may also need to improve on the clumsy design which makes the printer look a little too bulky. 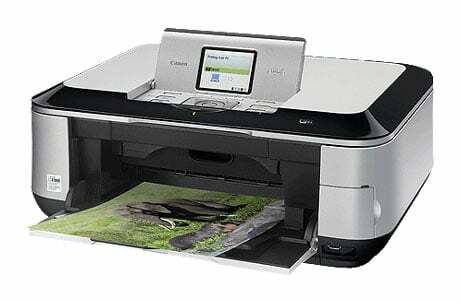 At 8.8 Kg, the Canon Pixma MP640 is quite light for a multifunction printer that has an integrated scanner and copier. The features are packed in a 450mm wide, 176mm tall, and 368mm in diameter body – a little too big for small desktops. The scanner and copier are both fast and produce vivid copies. The print resolution of the Canon Pixma MP640 s an impressive 9600x2400 dpi, and you can expect high quality photo prints with its 5-ink technology. The output paper tray and the control panel cover can be closed when not in use, and the TFT screen is bright and integrated under the cover of the control panel. Apart from wireless connectivity, it also has Ethernet for your wired network. The five-ink system produces high-quality documents and photos, but unlike other multifunction printers by the same manufacturer, the Canon Pixma MP640 prints a little faster at 9.2 ppm in monochrome and 8.1 ppm in colour. Prints come out sharp. The dual paper input allows you to use either regular or photo paper. A DVD/CD printing tray is also integrated into the Canon Pixma MP640, along with an auto duplexer. You can print directly from a memory card or a flash drive, as well as through a wireless network. Unfortunately, running the Canon Pixma MP640 is not cheap because of the expensive ink cartridges. You may also want to get an optional Bluetooth adapter (another expense). The auto-duplexer is sub-par in terms of speed, and some users report having to reboot the printer before they can scan a document and automatically convert it into a PDF file for the PC via Wi-Fi. Some users also report that the wireless connectivity features of the Pixma MP640 are not the most reliable.